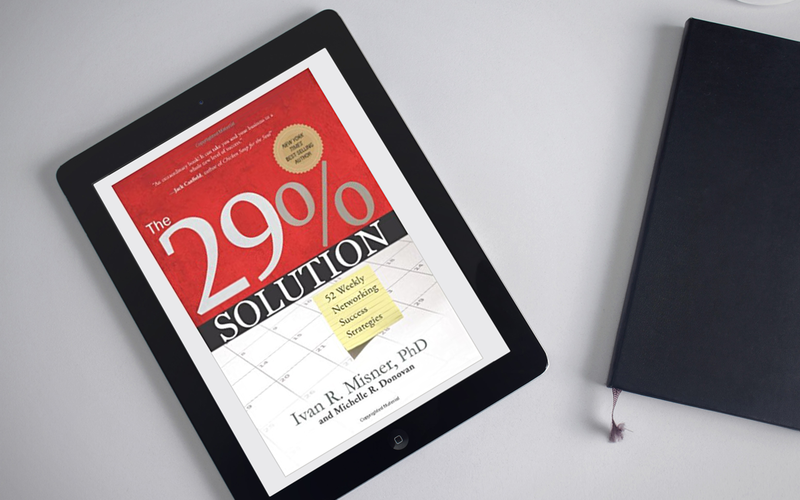 The 29% Solution by Dr. Ivan Misner and Michelle Donovan. Misner’s history and knowledge on the book’s core topic is global, and his track record of success is something that few people can rival. This isn’t simply a book you breeze through and set back on the shelf. It’s much more than that. It’s a detailed blue print that you the reader will richly benefit from if you read it and apply it within your own life and business. You’ll quickly discover that the book is broken down into 52 segments based on weeks. The original intent of the book was to assemble these tips into bite sized nuggets as a resource guide for BNI chapters to use and guide them across the globe. Misner’s history and knowledge on the book’s core topic is global, and his track record of success is something that few people can rival. This isn’t simply a book you breeze through and set back on the shelf. It’s much more than that. It’s a detailed blueprint that you the reader will richly benefit from if you read it and apply it within your own life and business.